The Wizard began as a simple idea: Cut the Pitchgrinder down to a single pitch shifter, with a mix control. What it became is something much more exciting, with brand new capabilities. The pedal’s resolution has been cranked up to 32 bits from the ‘Grinder’s 8, but the same lo-fi glitchy sound. There is a mix control. Then we have the “speed” control. 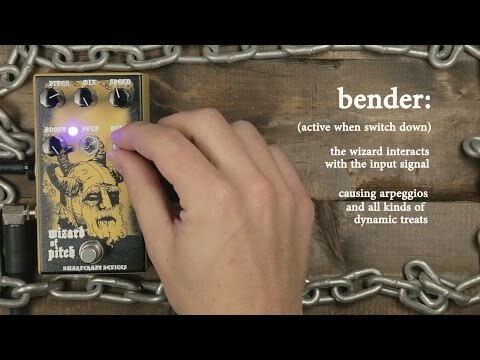 When set to zero, the Wizard behaves like a standard pitch shifter, but as you turn up the speed your output will cross fade between the wet and dry signals, allowing for beautiful moving soundscapes, or stimulating modulation at higher rates.